My dad is one-of-a-kind. He is on dialysis, lost his leg to cancer, wears a pacemaker, and recently fell and hurt his back. And he still keeps active with what he loves to do!! He has a garage sale every so often to weed out his tools. He has hundreds of hammers, wrenches, and drills that he has used since he was a teenager for woodworking, car body repair, metalsmithing, jewelry making, and all kinds of other mantastic activities. Every Saturday, DeAngelo goes over to help him. Last Saturday after dropping off Deangelo there, I checked out my dad’s buffer thingies (name?? heavy tabletop machines that have two wheels on each end – a buffer and a sander/grinder), which I’ve always wanted for my own workshop. As I scoured through the hammers and anvils, I noticed him sketching something. Tired of his boring marker-on-foamcore signs that he set in front of the house, he decided to upgrade his promotions and make a sign from wood. I watched as he drew the block letters and then talked about how he was going to use latex housepaint. “Can I make your signs?” I asked. Ooooh, little did he know that left it wide open for me to go to town! 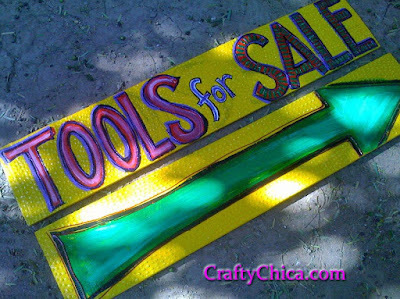 I used my Crafty Chica paints for the background and letters and then I outlined them with Tulip 3D Glittered Fashion Paint. I added a background of polkadots and then sealed it all in with high gloss varnish. “No – I mean they are really cool, he’ll like them!” she said. So next time you need a yard sale sign, pick up some light wood fromt he craft store and give it a paint job. You can nail it to two stakes to insert into your lawn, or a folding stand if it is for the sidewalk. Have fun with it – if your sign looks exciting and happy, it will increase the chances of people stopping by. Everyone likes happy, right??? P.S. Check out my new book and product line! No glitter on the signs??? Seriously though, he’ll probably be swamped as a result of those signs! P.S. I love your new header. I loved the sign Kathy and your story behind it. Great job!! Oh thanks Crafty Chica, I’m having a Mother’s Day Sale Extravaganza, and I think a colorful sign like yours will draw a lot of my customers. Thanks for the great idea. You are so right, as visual beings it is only natural to gravitate towards the shiny and colorful. Kudos on the sign! A “must do” this spring… we’re only allowed to have garage sales once a year… so if that’s the case I am going ALL OUT! Thanks for the inspiration.